Why were sonnet sequences popular in Renaissance England? In this study, Christopher Warley suggests that sonneteers created a vocabulary to describe, and to invent, new forms of social distinction before an explicit language of social class existed. The tensions inherent in the genre - between lyric and narrative, between sonnet and sequence - offered writers a means of reconceptualizing the relation between individuals and society, a way to try to come to grips with the broad social transformations taking place at the end of the sixteenth century. 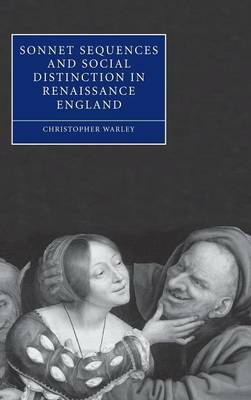 By stressing the struggle over social classification, the book revises studies that have tied the influence of sonnet sequences to either courtly love or to Renaissance individualism. Drawing on Marxist aesthetic theory, it offers detailed examinations of sequences by Lok, Sidney, Spenser, Shakespeare and Milton. It will be valuable to readers interested in Renaissance and genre studies, and post-Marxist theories of class.